The share of wireless-only households was 2.8 percentage points higher than the same period in 2012. That’s slower than in previous years. In 2010, the wireless-only share grew by 5.2 percentage points; 4.3 percentage points in 2011; and 4.2 percentage points in 2012. As one might expect, young adults are the most likely to be living the wireless-only lifestyle. Nearly two-thirds (65.7%) of 25- to 29-year-olds, 59.7% of 30- to 34-year-olds, and 53% of 18- to 24-year-olds live in wireless-only households, according to the center. However, those percentages are little changed — and in some cases even below — those recorded in the first half of 2013. However, as more people in older age brackets go wireless-only, the stereotype of cord-cutters as footloose Millennials is becoming less accurate. 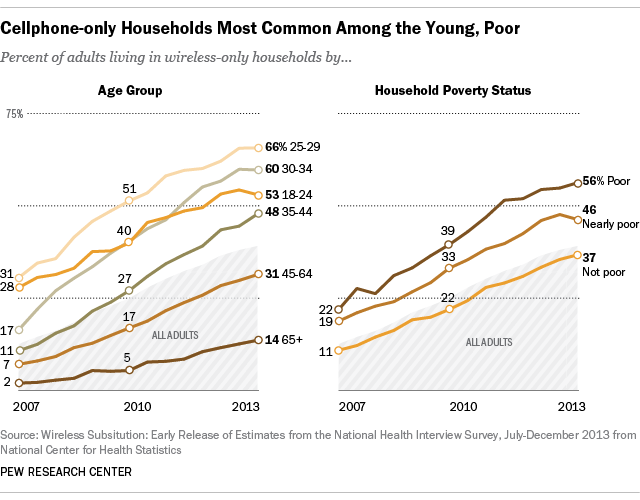 In the second half of 2010, more than half (52.5%) of people in wireless-only households were aged 18-34; in the most recent report, only 45.5% were. A majority (56.2%) of poor households have no landline service, the only economic group for which that’s true. Hispanics were the racial/ethnic group that was most likely to be wireless-only — 53.1% lived in households with no landline phone. People in the Northeast were considerably less likely than residents of other regions to be wireless-only. Just a quarter (24.9%) of Northeasterners reported living in households with no landline phone, versus more than 40% in the Midwest, West and South. An analysis last year of first-half 2013 data found that Idaho had the highest percentage of wireless-only households — 52.3% — while New Jersey had the lowest at 19.4%.